Launched five years ago by Paul, Mary and Stella McCartney with the slogan 'One day a week can make a world of difference', Meatfree Monday is about awareness of the impact of intensive animal farming on the animals themselves and the environment. It's also about habits: consciously changing our habits even on a very small scale can make a huge difference overall. Eating less meat has been proven to improve our health (and our wealth). Our local campaign aims gently to persuade local people, restaurants, cafes, businesses and institutions to try and provide more and better vegetarian options for their customers, clients and users, starting from giving it a greater emphasis one day a week. Whether you live in a flat with just a window-ledge or a house with a big garden, you can still grow your own food and create new habitats for wildlife. The estimates for the environmental impact of an omnivorous diet compared to a vegetarian or vegan diet vary dramatically, however a UN report produced five years ago estimated that raising animals to eat generated more greenhouse gases than all cars and trucks in the world. Raising animals to eat requires food (from crops, which could otherwise be feeding people directly), land, and large quantities of water. Forests are chopped down to create grazing land, and this in turn causes topsoil reduction, which leads to desertification. We found that many people would like to eat less meat but don’t have the confidence to cook vegetarian food and don’t have a repertoire of vegetarian dishes. 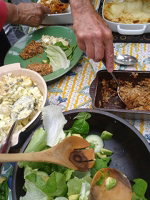 So we held a “vegetarian cook-in” in July, where participants each brought a pre-prepared vegetarian dish for all to share, talked about the preparation and shared copies of the menu. Our next cook-in will be on 24th November, with a Christmas theme. See events for more information. A joint initiative of Transition Westcombe and the Greenwich & Blackheath Eco-Group, the marine plastic project is our biggest on-going campaign, linking different parts of our community in direct response to the destructive effect of one-trip plastics like bags and bottles on the marine environment. Combining science, citizenship and art, schools participate in the project from many different angles. Students at local schools have been very creative in their response. In one secondary school the project became part of the art department’s “Change your Style” campaign – creating artistic responses to changing personal behaviour. Schools can buy Fairtrade cotton shopping bags at cost to be painted or printed by the children with their logos, messages, slogans and pictures – the bag becoming a loud creative advertisement for eco-friendly behaviour as children take their bags home to share the message with their families and communities. Inspired by the project, some schools have undertaken a 'waste audit' and a 'beach clean-up' on the Thames at Greenwich. All children show great knowledge, enthusiasm and a determination to reduce, reuse and recycle!